Paul Motian was a musician that crossed back and forth across the borders of composition and improvisation, the traditional and avant-garde, and rhythmic discipline and abstraction. He was the first, along with Chico Hamilton, to truly break jazz drumming out of its regular role, focusing on color, shading and negative space as much as traditional support for his bandmates. The iconic figure’s passing late last year has spawned a number of well-deserved tribute albums, and Russ Lossing’s “Drum Music” is quite possibly the finest. Ironically, the recording was not originally intended as an elegy. The music contained on the CD was performed live as an 80th birthday present for Motian half a year before he passed away. Lossing, Motian’s long time collaborator on both the pianist’s record and his own records and his own is one of New York’s greatest oft-overlooked players. He possesses immense physical power at the piano, but generally tends toward understatement and delicacy, and consistently releases albums of very interesting material and cerebral but intensely emotional readings of standards. “Drum Music” is no exception. Surely a major reason for the success of the project is Lossing’s familiarity with Motian the personality, and his fifteen years experience playing the material with the drummer. Perhaps more important is that how much his aesthetic and approach seem to mirror those of his old partner. On ballads like “Last Call” and “Olivia’s Dream” one hears a tender introspection and a sure sense of time and foresight. Lossing’s tempos are slow but self-assured, moving with purpose rather than urgency – and just as Motian played Bill Evan’s sweetest songs without sentiment over 50 years ago, Lossing carefully tends the composer’s gardens without weeping all over the flowers. There is a great clarity in Lossing’s piano voicings on abstracted bebop numbers like “Fiasco” and “Mumbo Jumbo.” His wide reach is evident as he plays from all parts of the piano’s range, but more often than not, he goes for concise, complimentary bass lines and melodic dashes as opposed to thick chords, and in doing so produces a great deal of action and surprise in the music. The elastic rubato in the left hand regularly evokes Motian’s own elastic time, and is delivered with unwavering conviction. “Drum Music” has a disciplined rigorous, highly intellectual sound that is played out in a perfectly relaxed organic way. It’s a great testament of Motian the composer, a wonderful solo piano record in any context, and a fitting tribute to one of jazz’s greatest artists. 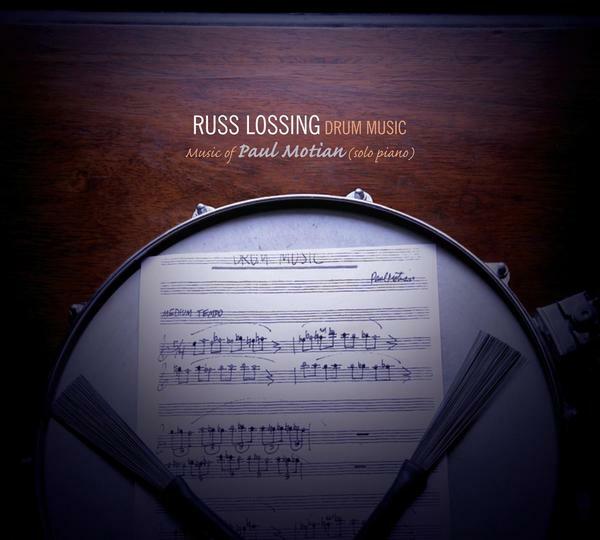 Nice to see a review of Russ Lossing's album - with a high score. I should give it a good listen when I have time. He's an excellent player, but I have to add that each time one of his albums pops up on the review list I find the music dense, interesting but a little intellectual. In the end I find my interest wandering, and so the impact of the music is often lost. However, as a side-man he's a great attribute to a band. Maybe this is the album that will make the penny drop! I don't know any of Motian's records that have Lossing on them. which were you thinking of? Yes, I guess Steve will have to answer that one. However Lossing and Motian played together a few times (with John Herbert if I remember correctly? ), and in the quintet of Paul Motion also. You can even find some excellent videos of the trio on YouTube, maybe even the quintet even!